Maintaining growth over three generations of family management takes a lot of hard work and commitment but above that it requires the ability to adapt and change as markets and circumstances evolve, taking the opportunities that arise and learning the new skills needed to stay efficient, legal and profitable. 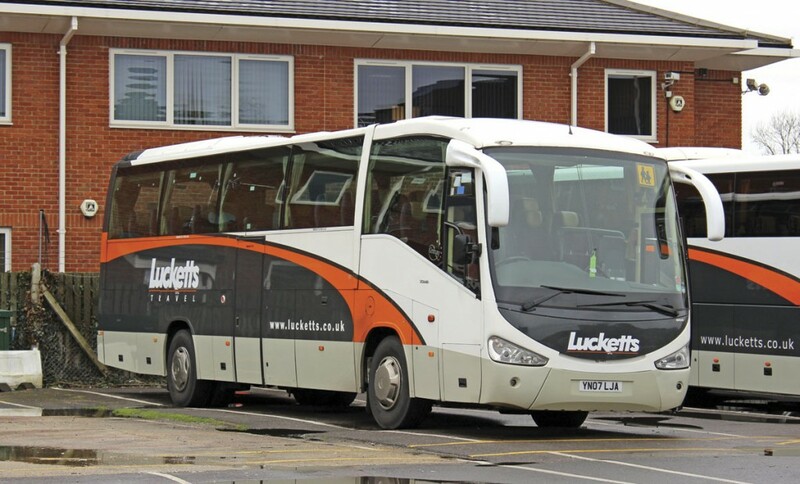 The Fareham based Lucketts group is an example of how to do it, running 130 vehicles (112 coaches) under three brand names on the South Coast. In the last four years, turnover has jumped 56% from £12.8m in 2010/2011 to over £20m in 2013/14, the latter figure higher than the £19m originally budgeted because the company was able to take on extra rail replacement work it hadn’t anticipated. In the same period, the number of staff has grown from 207 to almost 300. To find out what they do, how they do it and what they’ve been investing in, Stuart Jones called first at the Worthing Coaches operation meeting Group Operations Manager, Ian Macintyre, before going on to Fareham to see brothers and joint Managing Directors, Steve and Ian Luckett, who showed me the rest of the empire. Lucketts origins go back to 1926 when Harry Luckett started a haulage and storage business that ran alongside his farming interests. His son David joined in 1963 and took the reigns only three years later following Harry’s sudden death. The haulage business thrived and in 1976 David purchased his first coach from Armchair Travel, taking his test with Ben Stanley Coaches (where Steve Telling also drove). In 1983 his son Steve started working for the business, followed two years later by his brother Ian, by which time the coach fleet was up to 12, outnumbering the trucks. 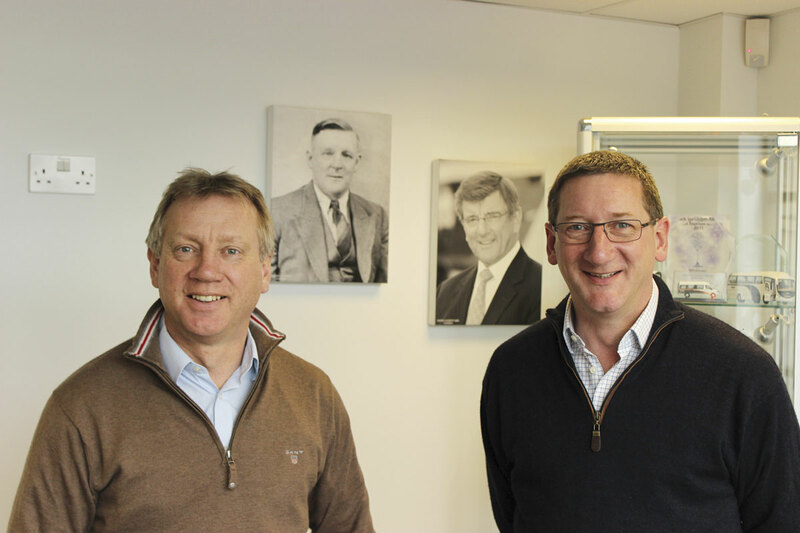 Today, David remains Chairman, though it is Steve and Ian who now run the company with a skilled team that includes, Ian Macintyre; Group Engineering Director, Mark Jordan; Sales & Marketing Director, Paul Barringer, and the latest addition to the team, Finance Director, Mike Allcock. 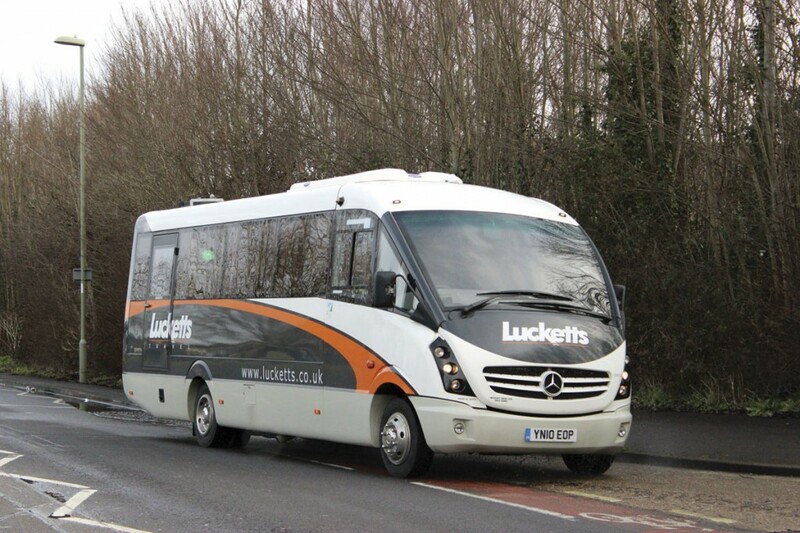 The main element of the group is Lucketts Travel, which has its base at Broadcut in Fareham. 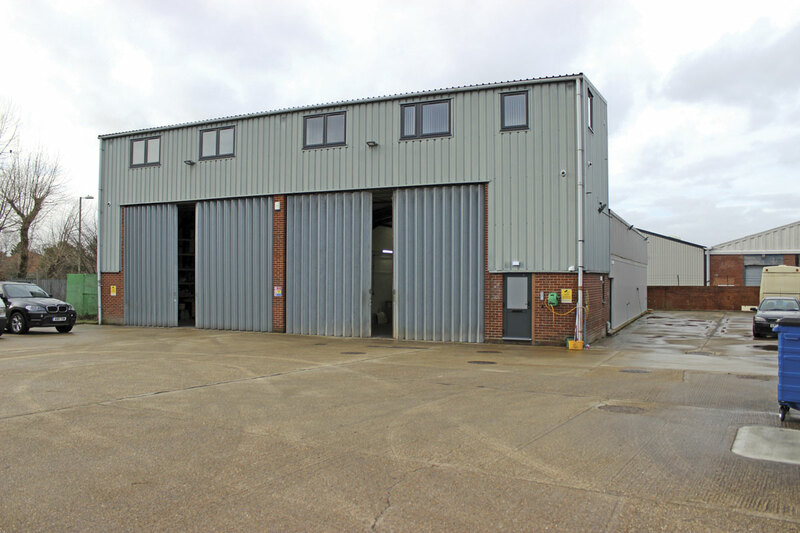 Completely modernised in 2010, it is a large site that incorporates a fully equipped four bay workshop facility, a sizeable coach parking area and a new office block at the front of the site that is the nerve centre of the operation. 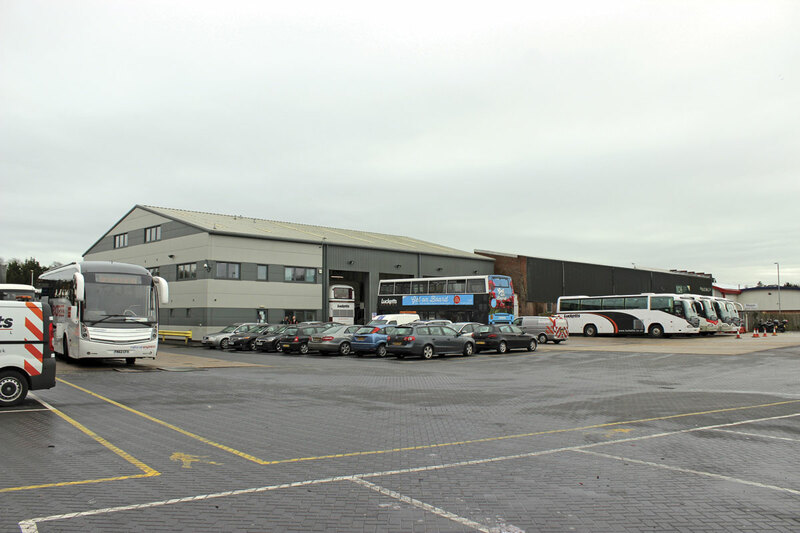 The Group functions are all based here though the Worthing Coaches depot at Lancing and Coliseum Coaches depot at West End have links to a real-time common platform ensuring anyone connecting to the system will have access to the same information. Plugging in his laptop in Lancing, Ian Macintyre explained, ‘Worthing Coaches operates as a satellite of Fareham with the same tools, so we can operate to the same standards. It gives a smaller business the systems and procedures that fundamentally make it a better operation. It enables us to be safe and compliant and gives us a leading edge.’ Ian has been with the company for two years after a career in aviation and aviation supply and learned from what that business went through. ‘It had to change because of cost pressures. If it was going to survive it had to do things differently, which was hard at the time but ultimately good because it made businesses better. He was attracted to Lucketts because he sees them as further ahead than many companies. ‘Their attitude and use of technology is in many ways, leading. We can continue to build on that and hopefully lead change in the industry,’ he said. Organisation is the key to efficient running and to this end the operations function has been restructured, as Ian Macintyre explained. Previously there was a controller each for private hire, National Express and contracts but this arrangement involved varying degrees of crossover, with delivery getting in the way of planning and vice versa. The solution was to split the work into three central functions (planning, delivery and support), with the planning function looking after everything the group does, so that there are now no boundaries between depots, allowing the best allocation of assets. The planning department works on a 180 day horizon allocating all vehicles way into the future. They monitor the situation to ensure there are no nasty surprises involving lots of vehicles and no work. Drivers are planned ahead as far as possible but realistically, the nature of coach operation has changed so much in the past few years that the plan is constantly changing, so too much notice would be counter productive. There is a desire to give staff as much notice as possible of work but it is a challenge. To help the staff plan and have a life outside of work, rotas have been implemented for private hire drivers, so that they at least know when their rest days are, if not what they are doing on the days they are at work. At 14.00 each day there is a meeting involving the planning, operations, engineering and sales departments at which the following day’s operations are handed over to the delivery team and that day’s programme becomes live. Any changes thereafter are taken care of by the delivery team who make sure that the drivers are prepared for their work and everything is delivered on time and to the correct standard. A supervisor with a group-wide remit is based in Fareham on a 24/7 basis, working closely with supervisors including those at the satellite depots. The third leg of the three part function is support, looking after administration, time sheets, pay, leave allocation and all other office administration functions. There is a separate compliance function for the very regimented compliance process that Lucketts has looking at drivers’ hours. Compliance is taken hugely seriously at Lucketts; I can’t remember visiting an operator that is quite as switched on to the requirements and uses the process of ensuring them, as well as the efficient operation of the rest of the business, in such a positive way to inform its actions and drive up standards. Every week there is a compliance meeting at which 25 different topics are addressed in great detail. All of the systems are in place to generate the information needed to confirm the current status against the criteria covered and there is a traffic light system that indicates the standing of every point on the list. Everyone attending has a full report to read beforehand so there are no surprises, the meeting can be kept concise, and the emphasis can be on understanding the causes of any issues and developing and pursuing a course of action that will put things back in the green. Particular attention is paid to any infringements that occur and the details on them are broken down and investigated. As a result the frequency of their occurrence is reducing. Requirements such as walk round checks are closely monitored, checks are made daily to ensure that every driver starting a shift has completed one. To ensure their validity there are also fault created checks so nobody can get away with just going through the motions. Jason, one of the National Express supervisors at Worthing showed me the sheaf of blue papers that were the walk round checks for a single day on the depot’s National Express coaches. This attention to detail is paying off because although there are generally between 400-500 vehicle movements a day, the number of infringements is now down to only 60 a month, and in many case that number is inflated because one error or incident will generate multiple infringements. Measured another way it equates to 0.02 infringements per hour of duty. 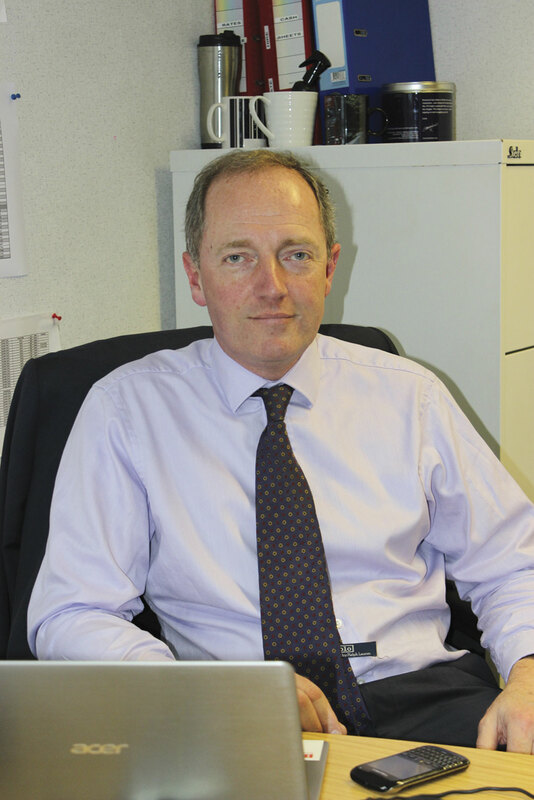 Ian Luckett explained that the company was one of the first to participate in the DVSA’s new ‘earned recognition’ project which is currently being proposed and scoped by DVSA. Under it, operators opt in to a system that opens their records to DVSA scrutiny, demonstrating the compliancy of the fleet and in return facing reduced roadside testing, enabling the DVSA officers to concentrate their efforts on non compliant fleets. Since 2008, the business has been working towards a completely paperless management system, and though it isn’t there yet (and they admit, probably never will be! ), a lot of progress is being made. From the start all paperwork (with the exception of legally critical documents, personnel records and data relating to accidents that may have to be presented in court) has been scanned, indexed and added to the document management system before the originals are securely destroyed. All invoices received are scanned and fed into a Sage system before being shredded. To become fully paperless, Steve and Ian would like to see tasks such as daily checks conducted using tablets or mobile phones and the results automatically fed into their back office systems, rather than these having to be manually entered which is very time consuming. Whilst there are many devices available on which the checks could be recorded, none are yet compatible with the Distinctive Systems computer systems used in the rest of the business, such as the VMS system used to run engineering. This means they will not take away process from the business and therefore will not be able to justify their costs. In the meantime they are operating dual paper/digital systems. 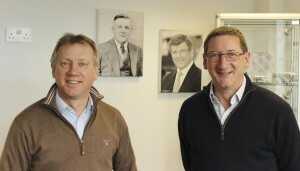 Lucketts has been growing slowly for many years helped by a number of acquisitions along the way. 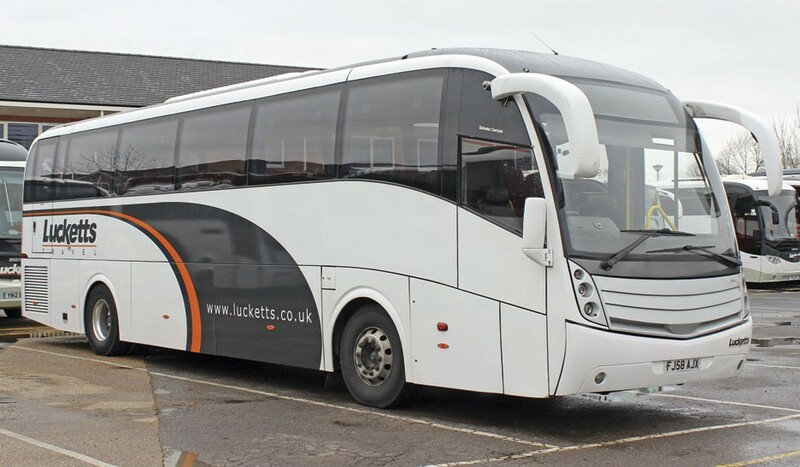 An early collaboration in the late 1980s saw Lucketts take on the coaching work of the former Provincial (Gosport & Fareham) bus business and operate vehicles in its colours for a period. 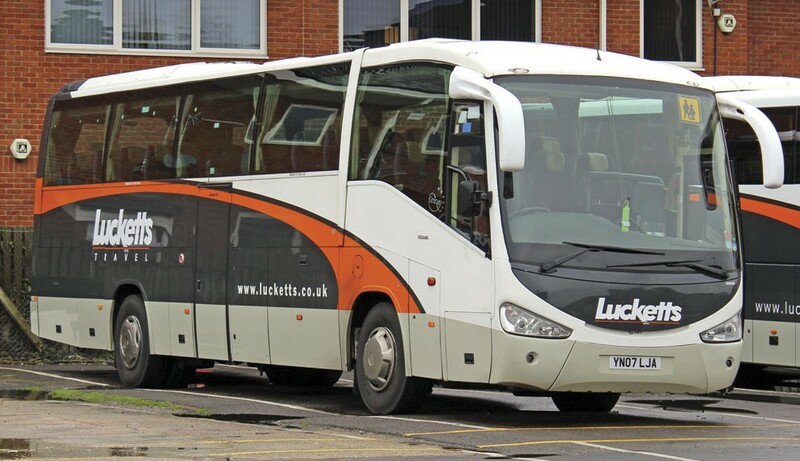 In 1999 a local company trading as Coachman failed and some of their work was taken on and in 2001/2 Geoff Flight proposed a deal for Lucketts to run coaches out of Portsmouth when Excelsior pulled out of the town. As a result some good work was acquired including the Royal Marines Band and Portsmouth FC. The next big deal was the acquisition of Worthing Coaches. The owners of Worthing Coaches, Don Gander and Richard Hart, approached Lucketts about the sale in 2005. It was smaller then than now but well respected locally with a good reputation, its own tour programme, a respectable client base and a travel shop in Worthing. 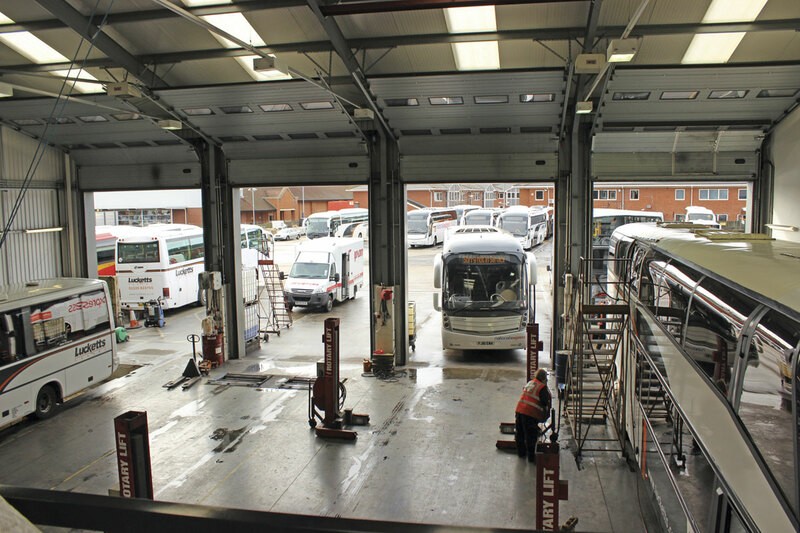 Located alongside the DVSA testing station in Lancing, the yard houses the whole of the current allocation of nine private hire and seven National Express coaches. The livery adopts the red and yellow that were traditionally the Worthing Coaches colours and continues to promote the Worthing Coaches name but both are applied in the latest Lucketts corporate style. The workload has changed and developed over the years and the allocation is now twice what it was at the time of acquisition, the biggest factor in this being the commencement of National Express work two years ago following National Express’s closure of its Crawley operation, which saw a number of staff transferring under TUPE. It isn’t quite a round the clock operation; the last coach returns to the yard at 02.15 and supervisory cover will recommence at 03.45. Apart from National Express duties, there is an active touring fleet, private hire work and the company’s own holiday and day excursion programme which involves a two-three vehicle commitment. Private hire work includes a number of long standing customers but also a lot of new ones and there is quite a considerable amount of rail replacement work. One school contract which starts on the Worthing side of Chichester and runs into a school near Fareham is covered, though this actually sits in the Fareham diary. A standard coach is used on it. On the ground management is provided by Private Hire & National Express Controller, Julie Young and Yard Supervisor, Grahame Mather and their team which includes four Supervisors. There are 41 drivers of whom 23 are on National Express and 14 on private hire. Julie and Grahame work staggered hours to ensure proper cover. Ian Macintyre told me that the nature of Worthing’s work meant the management team saw the drivers every day, ‘so it’s small enough to retain the personal approach despite it growing.’ He noted that the interaction between private hire and National Express drivers was closer at Worthing than Fareham, which was different. Some Worthing National Express drivers will also do private hire very well, which gives good flexibility, he noted. Purchased from the Pitter family in March 2012, Coliseum is a well established and successful brand that was already respected in the area and beyond. The allocation of 14 coaches is focused on touring with four committed to Angela Holidays work in their colours. There is also a significant commitment to Lochs & Glens, though in this instance vehicles retain Coliseum livery, which is the same as Lucketts but with different fleetnames. No Coliseum tours are operated but there is an excursion programme. In contrast to the Scania/Volvo dominance elsewhere, this part of the operation remains centred on Neoplan with no less than 10 Tourliners operated, in addition to which there are now two Scanias, including an OmniExpress acquired new, and the two latest acquisitions, a Van Hool Altano and an Irizar i6 acquired in December 2014. Clients mainly request 53 seat executives. Until a year ago, there was a Beulas Aura bodied MAN R37 tri-axle with an extremely high specification used for carrying Southampton Football Club but it was too specialised. Purchased a month ago, the Altano is to a high, but more flexible specification and is intended for dock transfers and cruise ship work. There are so many operators in the Southampton area that competition for private hire work is intense which is why they concentrate on touring although there is quite a bit of private hire undertaken, and at present a temporary contract is being covered. 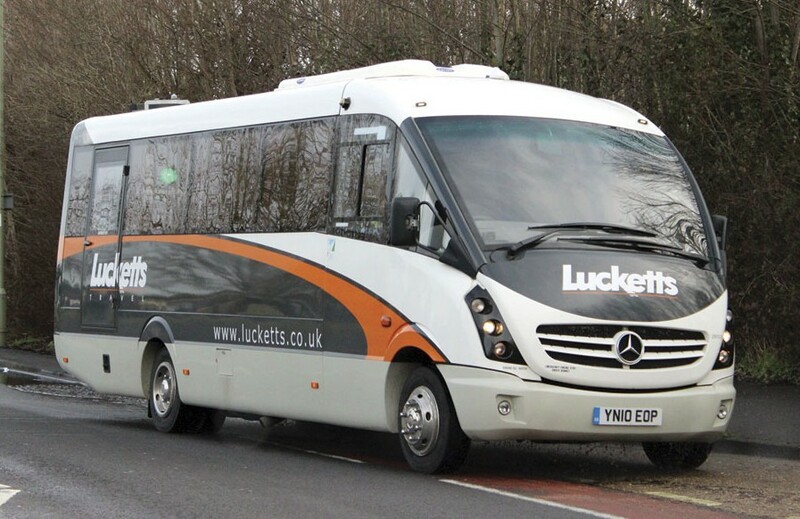 With 30 vehicles committed to the work, Lucketts is the biggest National Express contractor in the south of England. 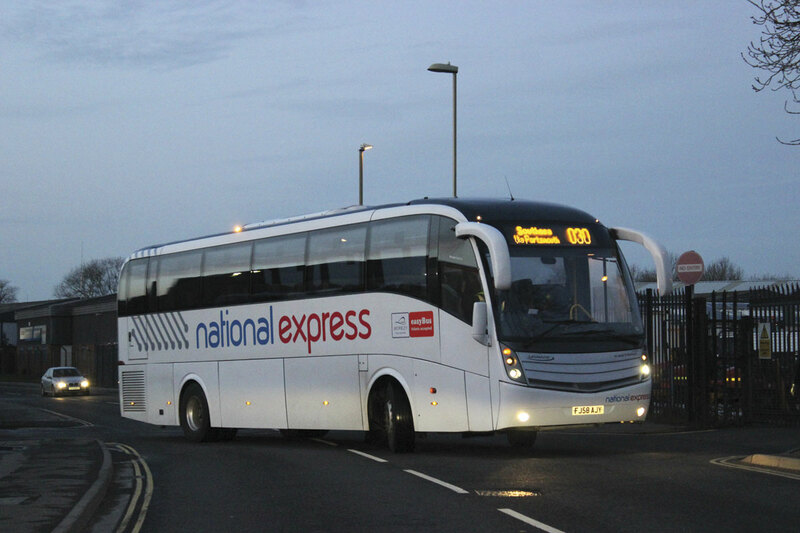 This aspect of the business began as recently as 2009 following an approach from National Express the previous year encouraging them to tender. 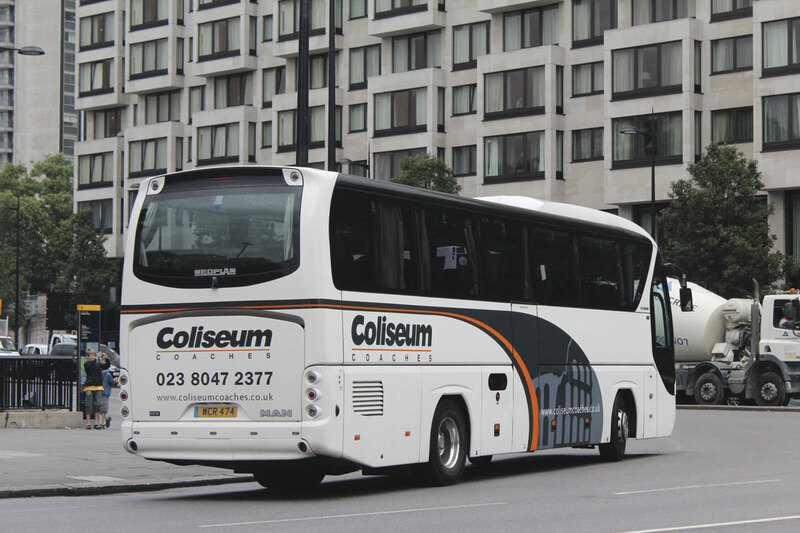 Winning it they took on responsibility for services from Portsmouth to London’s Victoria Coach Station (030), Heathrow Airport (203) and Bristol (300) that had previously been operated by Tellings Golden Miller, buying 12 brand new Caetano Levante coaches to carry out the work. With the success of the initial routes others were taken on in March 2013 including Worthing depot’s London, Gatwick, Brighton, Worthing (025) run and the Victoria Coach Station to Gatwick (A3) which was an additional Fareham duty. Conscious of the demands the growing fleet places on the maintenance team, a £130,000 investment has been made over the last few months in refurbishing and upgrading a four bay workshop in Gosport that was bought from the former directors of the Hellyer’s business 18 months after that went into administration in 2006. The only previous time that I had been there was in the early 1990s when it was the home of Priory Coaches. 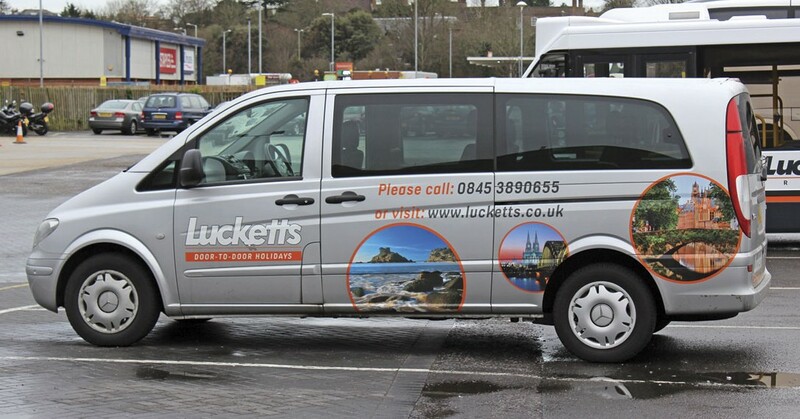 Prior to the property purchase a separate deal had been concluded with the administrators that had seen Lucketts acquire a couple of vehicles and the rights to the Hellyer’s telephone numbers, lists and other related assets. Ian Luckett explained the investment saying, ‘We have been spending too much money with outside body repair contractors because our own facilities had become stretched.’ Although there are two pits and the trolley jacks have been retained, it will be primarily used to provide light touch bodywork issues, such as the rear end damage to a Coliseum Tourliner that was occupying one of the lanes when I called, or the air conditioning servicing being undertaken in another. 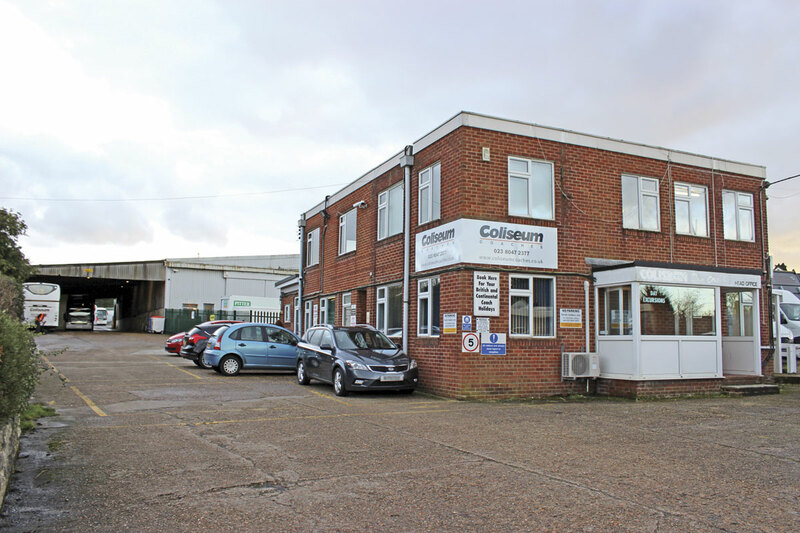 Two deliveries of parts a day are made from the £130,000 stores stockholding at Fareham. 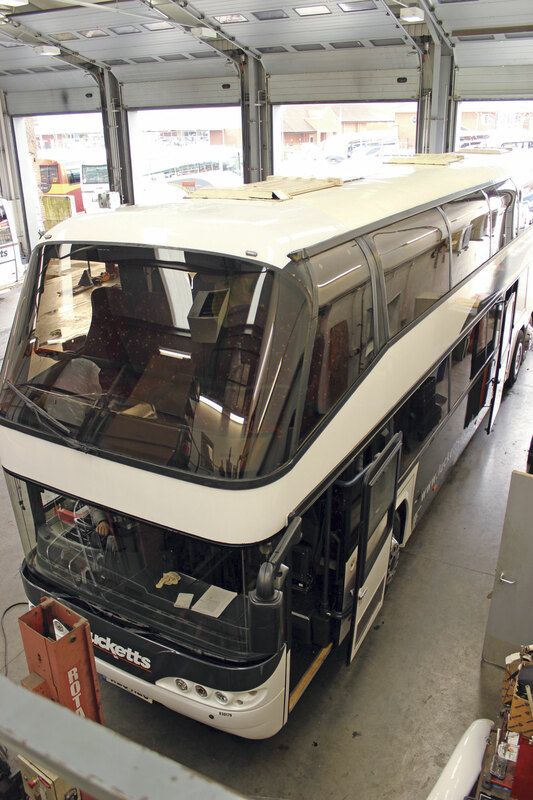 In charge of the very thorough renovation project was local resident, John Horn, a man well known to the bus industry for his past roles, most recently as Sales Director of Optare. He showed us round pointing out the features. Four bays wide and originally with a clear span, it has had a new wall erected down the centre in order to split it into two separate areas so that painting can be undertaken in one shop while mechanical or paint preparation work is being done in the other. A paint spraying facility is under consideration which would pre-prepare, paint and stock panels to go on vehicles so that they are ready as soon as they are needed. Work undertaken included fitting new doors and windows, re-cladding much of the exterior, rewiring, adding a new air system, upgrading the high definition CCTV system, ensuring Health and Safety compliance, adding energy efficient LED lights, refurbishing the staff areas, drying out the pit, installing a new compressor and replacing the toilets. Upstairs has been refurbished and altered to create a training facility where CPC courses can be held, as can recruitment events. One of the rooms has already had a projector and speakers installed. As well as the potential new paint facility, there may well be additional expenditure on automating the operation of the gates for security reasons. With a large yard currently somewhat underutilised, one driver who lives nearby now has his coach based at the site. Although quite a number of other operators have been purchased over the years, Ian Luckett was cautious on the subject of any further acquisitions. ‘We would look at them but they would have to fit our criteria, our type of operation and our brand and be a positive move for our business. If you buy an ailing or failing business it is ailing or failing for a reason. I won’t be there seven days a week pushing it, so it has to work on its own. The industry is full of hard working people prepared to put seven days a week in and not take seven days pay. I’ve got a life and I want other people to have a life,’ he said. Until recently Lucketts outsourced their training needs but they have now switched to running recruitment and training centrally, in-house. Ruth Grossett who has an engineering background and previously provided her services on a contracted basis, has been appointed to manage it. Her role is a varied one that includes support. ‘I’m the Sergeant Major one minute and an Agony Aunt the next,’ she said. Recognising that, ‘we’ve got some excellent drivers but bringing new talent into the business is a challenge,’ a series of ‘assessment centres’ are being held with the aim of attracting new drivers to the business, after a similar process was successfully staged to identify the best candidate for an operations manager role. Each assessment centre involves a structured interview followed by a driving assessment in a Mercedes Vito, an aptitude/geography test, a literacy and numeracy test, a psychometric test (that will ultimately replace the literacy test), and finally a group exercise. 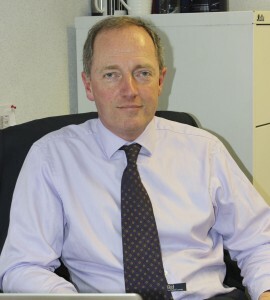 Ian Luckett told me that apprenticeships are another recruiting avenue under consideration. And it isn’t only a case of training the ranks, the company also believes in proper training for its managers and supervisors. 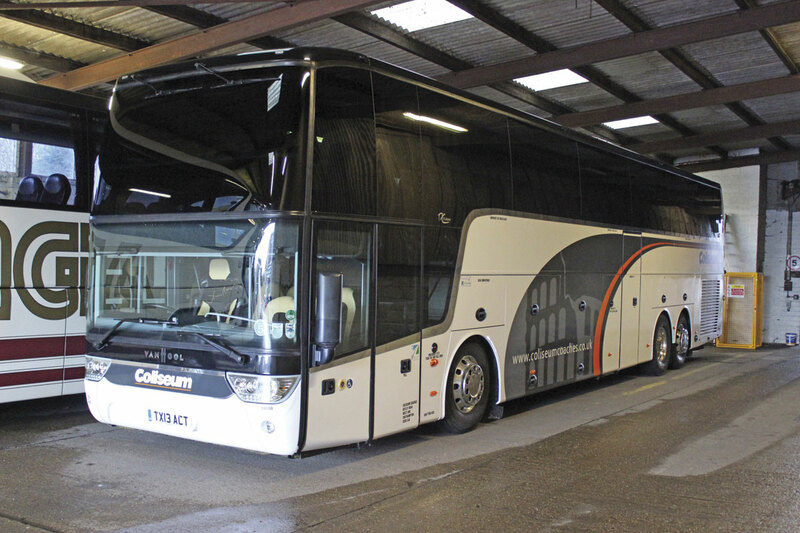 Though there are exceptions, the most numerous marque in the private hire operation is Scania, with Irizar coachwork of various types well represented though there are also a number of OmniExpress types. 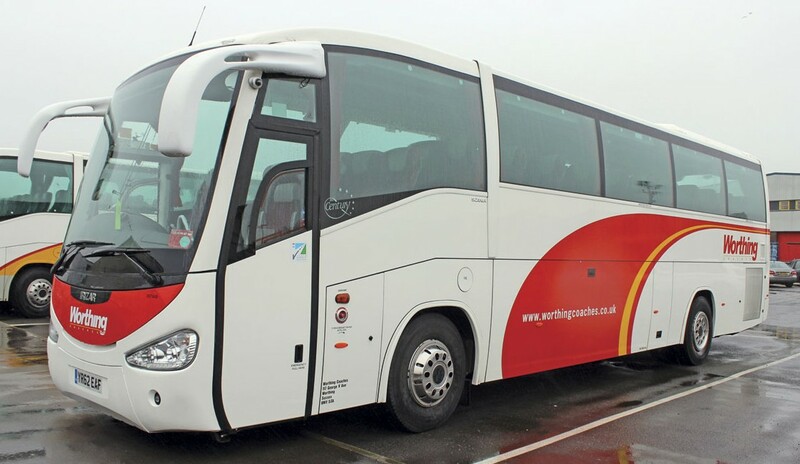 Taking on the National Express commitments saw 12 new coaches acquired at one time and a desire to stagger their replacement coupled with the wish to keep the fleet used on this demanding work young, have seen a number of Caetano Levante bodied coaches cascaded to private hire work. Ian explained that of eight coaches transferred, two were running in white with no changes, four had retained their lifts and toilets and been repainted and two so far had been fully repainted, retrimmed and refurbished as 53 seaters with the toilets removed and the front lift retained. The majority of the National Express Levantes are based on Volvo B9R chassis, though the earliest examples are Scania K340s. 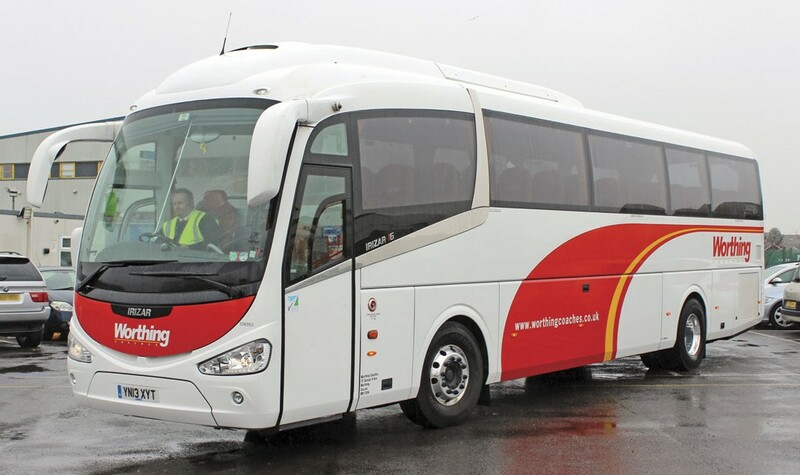 Two more Levantes on Scania chassis will be the first Euro6 coaches operated. 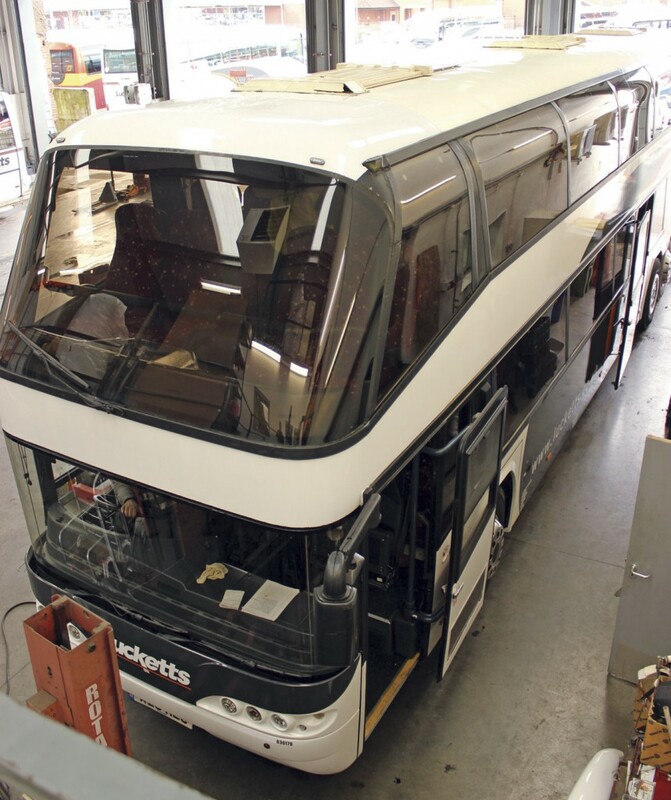 They will displace two more vehicles and investigations are underway to see whether they can be converted to 57 seaters if the front step lift is removed. 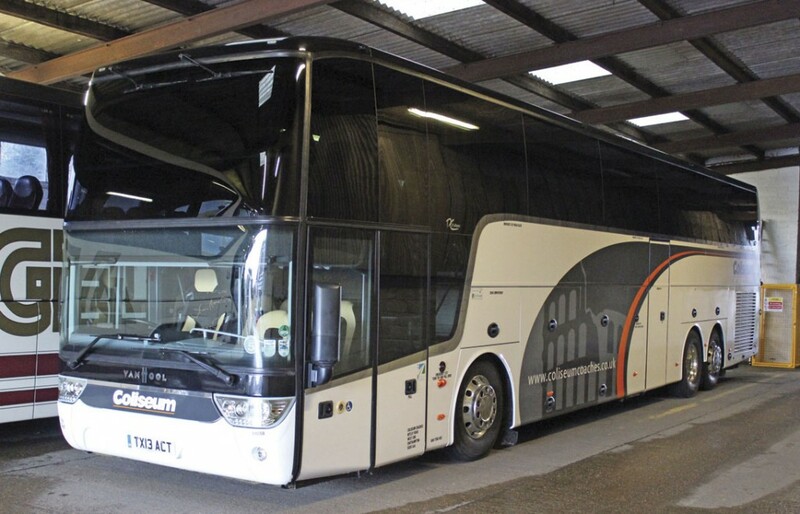 At one time four double deck coaches were operated but currently there is only one, a 2004 Neoplan Skyliner 77-seater. They have just committed to refurbishing it, though it will only be used on local private hire. The reticence about such coaches is that, ‘when they go wrong it causes big problems.’ There are also seven Volvo B7TL double deckers with President or ALX400 bodies used predominantly on contracts. Other buses include three Optare Solos and an Excel. 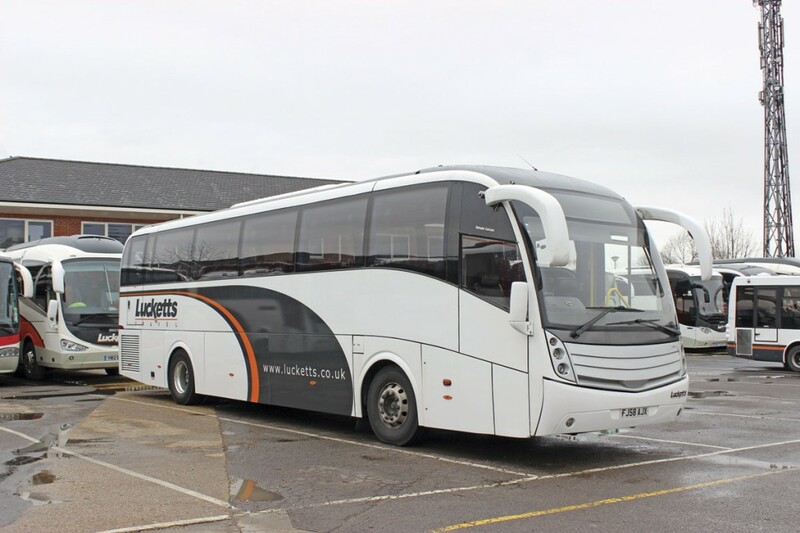 Initiatives to target the school contract and private hire market saw the acquisition of a fleet of 70-seat single deck coaches between 1998-2006: three Dennis Javelin Plaxton 320s and three Scania Irizar S-Kools. These all originally carried yellow liveries as was the fashion at the time, but it was found that this compromised their use at weekends and the newer ones have consequently gained fleet colours though a couple of Javelins retain the yellow. With the exception of a solitary Toyota Optimo, minicoaches are exclusively Mercedes-Benz, with examples of the Vito, Viano, Sprinter Travel 45 and Vario, all but one of the latter carrying Plaxton Cheetah bodies. Since I visited at the end of February there has been further recognition of the standing the company holds in the local community. The group was named Large Business of the Year by The News, the Portsmouth based newspaper, at its annual Business Excellence Awards.